Step off the beaten path and head to Cuchilla Alta and Playa Costa Azul Canelones. 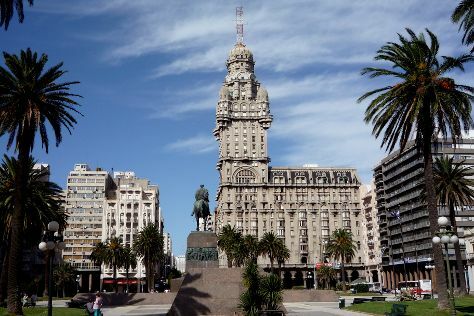 And it doesn't end there: don't miss a visit to Plaza Independencia, take in the local highlights with Walking tours, take a stroll through Pocitos, and take in the waterfront at Rambla de Montevideo. For ratings, other places to visit, reviews, and other tourist information, read Montevideo holiday builder site . Buenos Aires, Argentina to Montevideo is an approximately 2.5-hour ferry ride. You can also fly; or take a bus. In February, plan for daily highs up to 32°C, and evening lows to 21°C. Wrap up your sightseeing on the 22nd (Fri) to allow time to drive to Punta del Diablo. Formerly a sleepy little fishing town, Punta del Diablo has become a popular seaside getaway with a wealth of attractions natural and manmade. Kick off your visit on the 23rd (Sat): kick back and relax at Playa de la Viuda, appreciate the history behind Artigas Monument, and then kick back and relax at Playa de Los Pescadores. On the 24th (Sun), you'll have a packed day of sightseeing: kick back and relax at Playa Grande, look for gifts at Paseo de los Artesanos, and then stroll through Playa del Rivero. To find maps, reviews, ratings, and more tourist information, read our Punta del Diablo travel itinerary planner. Drive from Montevideo to Punta del Diablo in 4 hours. Alternatively, you can take a bus. The time zone difference when traveling from Montevideo to Punta del Diablo is minus 1 hour. Finish your sightseeing early on the 24th (Sun) to allow enough time to take a bus to Rocha. Relax by the water at La Pedrera and Playa de Punta del Diablo. You'll visit kid-friendly attractions like Playa Grande and Balneario Punta Rubia. You'll find plenty of places to visit near Rocha: La Paloma (Faro Cabo Santa Maria & Playa Los Botes). There's much more to do: kick back and relax at Playa La Moza, steep yourself in history at Fortress of Santa Teresa, don't miss a visit to Luna llena en el anden, and stroll through Las Achiras Beach. To find traveler tips, photos, more things to do, and tourist information, go to the Rocha trip planning site . Take a bus from Punta del Diablo to Rocha in 1.5 hours. Alternatively, you can drive; or take a bus. Traveling from Punta del Diablo to Rocha, you'll lose 1 hour due to the time zone difference. In February, plan for daily highs up to 29°C, and evening lows to 23°C. Wrap up your sightseeing on the 28th (Thu) to allow time to drive to Punta del Este. 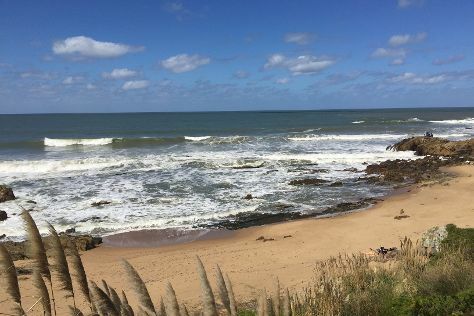 Step off the beaten path and head to Playa de Jose Ignacio and Playa Mansa. Relax by the water at Playa Portezuelo and Playa Chihuahua. Change things up with these side-trips from Punta del Este: Piriapolis (Playa Hermosa, Playa Punta Colorada, & more). There's still lots to do: tour the pleasant surroundings at Playa Pinares, see the interesting displays at Museo del Mar, enjoy the sand and surf at Playa Mansa, and take in the views from Puente Leonel Viera. For other places to visit, ratings, traveler tips, and tourist information, you can read our Punta del Este road trip planning app . You can drive from Rocha to Punta del Este in 1.5 hours. Another option is to take a bus. Expect a daytime high around 29°C in February, and nighttime lows around 23°C. Finish your sightseeing early on the 5th (Tue) to allow enough time to travel back home.